You need to keep on track with your sugar levels if you have diabetes since it is critical to maintaining a regular record for a successful diabetic management program. Blood glucose monitors allow you to achieve this without any hassle. They are handy, mobile, small, fast in performance and the best thing is that you can buy and keep it at home. The more accurate the machine will be, the higher the price will be. This diabetic blood machine comes with features of no coding, fast reading, and requires a tiny blood sample. 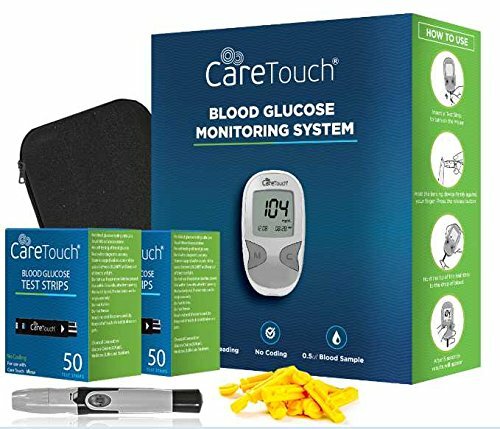 The Caretouch glucose meter kit provides everything you need for a glucose test. 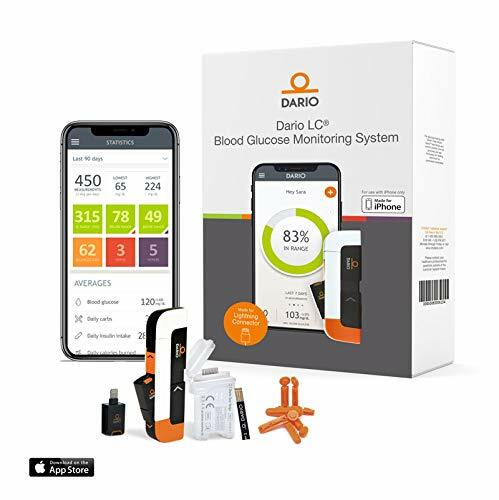 It comes with all the necessary accessories like the glucose meter, 100 test strips, 1 lancing device, 100 lancets, 3-volt lithium battery, compact carrying case, and the instruction manual for the user. It is a complete kit which makes it very easy to perform a blood sugar test. The strips are readily available and affordable in the market. The accuracy of this machine can be trusted. FAST RESULTS - Get results in as little as 5 seconds. NO CODING - Our monitors recognize batch codes encrypted on each test strip, so there is no need for you to manually insert any code with each new batch. HYGIENIC STRIP EJECTION - Our state-of-the-art monitoring system includes a single touch strip ejection, so you no longer have to worry about manually removing the soiled strip. It is a kit which is easy to set up and start using by the patients. Its key feature is easy to use and simplicity. A person who is new to testing sugar levels would find it the best choice. The Contour Next Diabetes Testing Kit is designed to give you reliable and accurate results in just 5 seconds. It works with no coding technology, which eliminates the manual setup option. It needs a tiny amount of blood and gives results in just 5 seconds. The whole kit comes in a black case which makes it very convenient to assemble and carry it anywhere. The test strips are cost-effective and readily available. With every kit, you get 100 lancets. 100 alcohol preps, and 100 Contour’s test strips. This is a compact and a very extremely user-friendly kit. It has a big screen which makes it easier for the patients to read and carry out the three-step simple testing process. The kit contains a lancing device, meter batteries, 10 lancets, a carry case, control solution, user manual, and a log book. You also get a clear cap to collect blood from forearm or palm and a diabetes food booklet. The reviews say that its lancing device can be improved. The Easy Touch Diabetes Testing Kit is one of the best sellers as it boasts of its accuracy. The kit comes with a glucose meter, a logbook, hundred test strips, instructions, 100 lancets, and a carry case. In just 5 seconds you get the reading by using a tiny bit of your blood. It provides quick and painless testing to the patients. The key feature of this kit is the four-alarm setting where you can save your previous readings for weekly and monthly averaging. It comes with an 18-month warranty on all components. 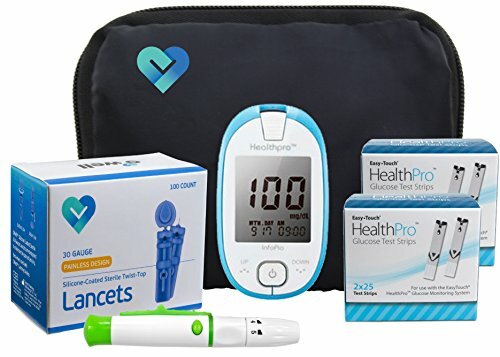 VALUE STARTER KIT: Includes; Health Pro Diabetes Meter, 100 Health Pro Test Strips, 100 OWell Lancets, Lancing Device, Manuals, Log Book & Carry Case (control solution sold separately). FAST RESULTS: Results in as little as 5 seconds with a tiny 0.5µL to get an accurate reading. NO CODING: Comes pre-coded and works straight out of the box. Perfect for patients that prefer the latest technology. 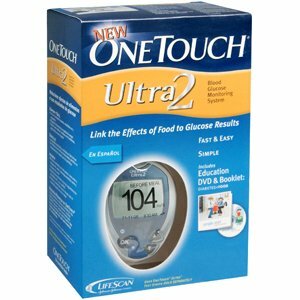 With its pc port capability, 5 alarm settings with saved glucose level tests with time, date, & 7, 14, & 30 day averaging. Pre & Post meal recognition. The Easymax V talking meter is a kit for qualitative measurement of sugar levels of a patient. It has been designed to be dependable, easy to use, compact, lightweight and portable to help a patient monitor his blood sugar levels regularly. 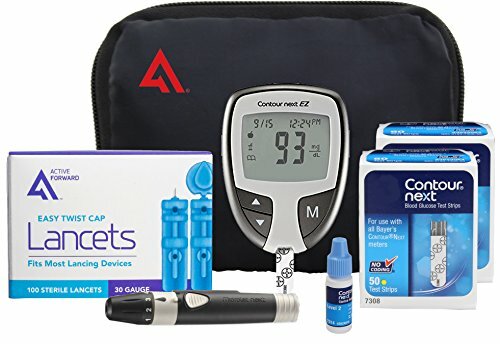 The kit comes with blood glucose meter, 10 test strips, carrying case, two batteries, 10 lancets, lancing device, user manual, quick reference guide, control solution instructions. The key feature to this kit is that you can see as well as here the accurate test results in English or Spanish up to 248 readings. It also saves the readings with time and date with 7, 14, 30 and 90 days averaging. It has a large font and screen with no coding required. A very easy-to-use machine for blind people. It is the most common home blood glucose monitor used recommended for them. It is said that simple is always better for the elderly, kids or anyone with diabetes and is using a glucometer. Many steps may lead you to mistakes. So the best blood glucose monitors are those that make the basic process of blood testing to be as accurate as possible. 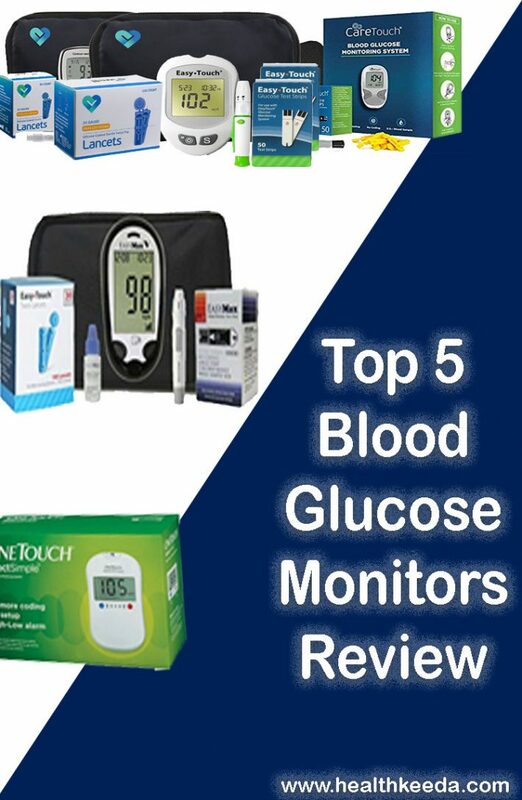 All the above blood glucose monitors are guaranteed to offer you accuracy and the best experience as you keep a check on your blood sugar levels. You can also look for Blood Sugar Monitor without blood.